Cavalcade carrying Deputy Chief Minister Sukhbir Singh Badal got stuck in the traffic for over 10 minutes on the Ferozepur Road today afternoon, as Qila Raipur MLA Jassi Khangura along with Youth Congress workers was taking out a victory procession at the same time after the announcement of the Youth Congress results. The vote bank politics came to the fore when Punjab Deputy Chief Minister Sukhbir Singh Badal decided to attend a function organised by the Christian community at a church in Sarabha Nagar here. Deepak Khandoor has won the Youth Congress election from the Ludhiana Lok Sabha constituency by defeating Rajiv Raja of the Dimple Rana (former District Youth Congress president) group. Khandoor managed to secure 288 votes, while Rajiv Raja got just 274 votes. Other candidates, Guriqbal Singh Vicky Sekhon got 262 votes, Amrinder Pal Singh Jawaddi 171 votes, Jaspreet Singh Ahluwalia 162 votes, while Parvinder Singh managed to secure 134 votes. Divisional Railway Manager (DRM) Vishvesh Chaube has marked an inquiry into the Shatabdi-Car accident that took place near the Gyaspura level crossing on December 15. The Railway authorities have suspended Ram Aadhar, the gateman, on duty at the level crossing. Though the women and child welfare department has provided telephone No. 1098 for the child helpline, still those attached with the cause feel that not much is being done for their welfare in the city. The Child Welfare Committee (CWC), which is supposed to meet every week to discuss cases about child labour or “atrocities” against children, hardly gets time to meet and discuss issues related to them. A dental check-up camp was organised at Ryan International School, Dugri. Dentists gave several useful suggestions to students like brushing teeth twice a day, using quality and branded toothbrushes and tooth pastes. Students were told to have a balanced diet. A fire broke out at a shop in Block C of Bhai Randhir Singh Nagar this evening. Tilak Raj, sub-fire officer, fire brigade department, said the fire broke out at the first floor of Ranbeer Fancy Dress Shop and the reason behind the inferno was yet to be ascertained. For making the rally of Shiromani Akali Dal (Badal) at Moga a hit, the party leaders have asked private bus operators of the district to provide 400 mini buses and 100 full sized buses. Transporters said SAD workers had even asked various educational institutions of the district to provide buses for the rally, which is scheduled for Sunday (December 18). With the officials busy making arrangements for the rally to be taken out by Shiromani Akali Dal (SAD) at Killi Chahlan village near Ajitwal on Sunday, residents of the town have been facing a harrowing time for the past three days. 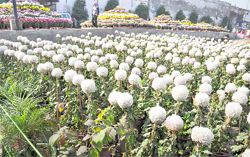 An aromatic delight welcomes devotees at Gurdwara Dukh Niwaran Sahib as around 105 varieties of chrysanthemum have been put on display at the entrance to the Gurdwara complex. 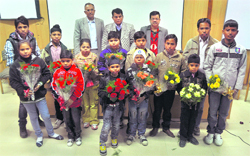 Continuing their mission under the organisation’s Corporate Social Responsibility Programme, officials of the State Bank of India gave stationery and books to needy students of various schools. After Ludhiana girls emerged champions in handball yesterday, it was the turn of city lads to corner glory. They warded off the stiff resistance from Mohali 33-23 to secure a berth in the title clash on the penultimate day of the 26th Coca-Cola Annual Sports Festival being organised by the Mata Sahib Kaur Sports Club at Jarkhar village on the Ludhiana-Malerkotla road.